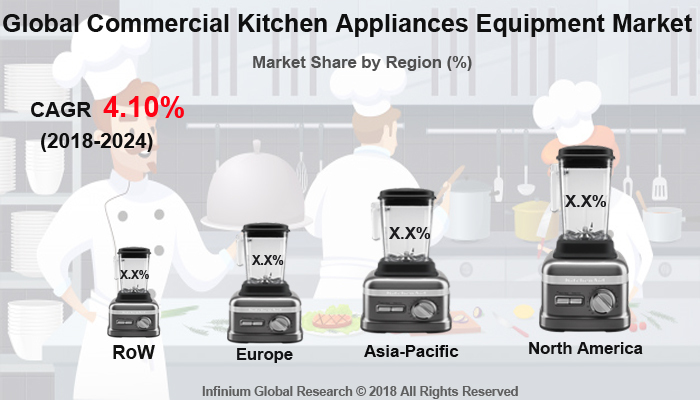 A recent report published by Infinium Global Research on commercial kitchen appliances/equipment market provides an in-depth analysis of segments and sub-segments in the global as well as regional commercial kitchen appliances/equipment market. The study also highlights the impact of drivers, restraints, and macro indicators on the global and regional commercial kitchen appliances/equipment market over the short term as well as long term. The report is a comprehensive presentation of trends, forecast and dollar values of global commercial kitchen appliances/equipment market. According to the report, the global commercial kitchen appliances/equipment market is projected to grow at a CAGR of 4.10% over the forecast period of 2018-2024. Commercial kitchen equipment consists of a range of cooking, storing and cleaning equipment that has been designed to meet the demands of professional chefs and kitchen operators. Commercial kitchen equipment ranges from freezers, slicers & mixers, food processors, sinks, microwave & ovens, safety equipment and several other types of equipment. These equipment are manufactured in such a way that it can withstand a busy restaurant or food joint schedule. The commercial cooking equipment is easy to use and cooks food more quickly than traditional cooking methods, which eventually leads to lower energy consumption. These products reduce the time required for cooking as well as cleaning kitchenwares. Growing popularity among the consumer related to restaurants and increasing inclination towards modern lifestyles across the globe are the driving factors for the growth of the commercial kitchen equipment market. Furthermore, growing demand for energy-efficient and cost-effective commercial kitchen equipment are facilitating growth in this market. Moreover, rising hospitality business across the globe is also supporting factors for market growth. However, huge capital investments required for a commercial kitchen set up may hamper the growth of commercial kitchen equipment market. Going forward, improvements in existing appliances design and the introduction of new features may provide growth opportunities for the commercial kitchen equipment market. Among the geographies, North America region holds the highest revenue in the Commercial kitchen equipment’s market. The growth in this region is mainly attributed, owing to the high spending capacity of the people starting a restaurant business. The new entrants in this business are purchasing a range of commercial cookware in order to innovate menu and also increase the efficiency of the kitchen. Moreover, an increasing number of food trucks and fast food joints in this region are also the reason for facilitating growth in this region. The Asia Pacific region is anticipated to grow at the highest CAGR during the forecast period owing to growing food services industries in this region. Rising popularity among the people related to the Quick service restaurants brand is projected to have the highest growth in this region over the forecast period. The report on global commercial kitchen appliances/equipment market covers segments such as product type and end-user. On the basis of product type, the sub-markets include refrigerator, cooking appliance, washing and drying equipment, mixers and blenders, and kitchen ventilation. On the basis of end-user, the sub-markets include QSR (quick service restaurants), institutional canteen, railway dining, ferry & cruise, resort & hotel, FSR (full-service restaurant), and hospital. The report provides profiles of the companies in the market such as Hamilton Beach Brands, Inc, Carrier Corporation, MEIKO GROUP, Universal Steel Industries Pte Ltd, Fagor Industrial, American Range, Hobart International (S) Pte Ltd, Hoshizaki Corporation, Interlevin Refrigeration Ltd, and Electrolux. The report provides deep insights into the demand forecasts, market trends, and micro and macro indicators. In addition, this report provides insights into the factors that are driving and restraining the growth in this market. Moreover, The IGR-Growth Matrix analysis given in the report brings an insight into the investment areas that existing or new market players can consider. The report provides insights into the market using analytical tools such as Porter's five forces analysis and DRO analysis of commercial kitchen appliances/equipment market. Moreover, the study highlights current market trends and provides forecast from 2018-2024. We also have highlighted future trends in the market that will affect the demand during the forecast period. Moreover, the competitive analysis given in each regional market brings an insight into the market share of the leading players.